It's a bibliophile's dream. The ultimate book collector's collection. The new Dr. Elliott and Eileen Hinkes Collection of Rare Books of Scientific Discovery ranks among the most important collections to have come to Johns Hopkins in the past half century, according to Earle Havens, curator of early books and manuscripts for the Sheridan Libraries. Comprising approximately 300 rare books, the collection vividly illustrates major milestones in the history of ancient and modern scientific discovery, from the early documents, pamphlets, and books of the 15th century up to the 20th century. The collection's earliest and rarest materials include a 1495 edition of the celestial works of Aristotle and early editions of influential works by Nicolas Copernicus, Johannes Kepler, Galileo Galilei, and many others. "This is one of the most important donations in the history of the Sheridan Libraries at Johns Hopkins," enthuses Havens on an afternoon in late summer, as he browses reverently through the collection, housed in the Rare Books and Manuscripts Department of the Milton S. Eisenhower Library. "The collection gives Johns Hopkins immediate access to the very origins of what it excels in every day in our laboratories and classrooms and libraries—allowing the university to connect far more than ever before with the history that has made Hopkins what it is today: an international center of learning and scholarship." According to Havens, nearly every "monumental scientific publication" of the early- to mid-20th century is represented, in rare offprints of essays (some of them signed by the original authors) and in first editions by such groundbreakers as Albert Einstein, Max Planck, Ernest Rutherford, Edwin Hubble, Linus Pauling, and more. Other highlights: a leaf of the Gutenberg Bible, which was the first book produced by movable type; the first in-print appearance of Charles Darwin's theory of evolution; a 1687 first edition of Sir Isaac Newton's treatise on gravitation; and original copies of the three 1953 articles by scientists Watson and Crick that first outlined the structure of DNA. "We are greatly indebted to the late Dr. Elliott Hinkes, who lovingly acquired and cared for this gem of a collection, and who, supported by his wife, Eileen, and son, Eric, was determined that it come to Johns Hopkins," says Winston Tabb, dean of University Libraries and Museums. Adds Tabb: "When I first met Dr. Hinkes seven years ago in his library in Los Angeles, I realized I was in the presence of a rare, self-taught bibliophile; he was not omnivorous, but very focused and disciplined and selective, which is why each of the volumes in the Hinkes Collection evokes superlatives from those who have seen the collection." The recently acquired Hinkes Collection illustrates major milestones in the history of ancient and modern scientific discovery. 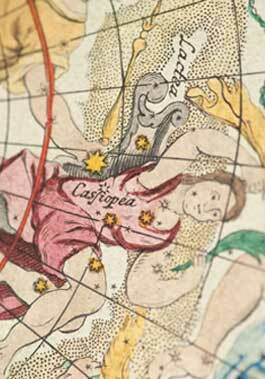 Here, a hand-colored engraved print representing the constellation Cassopeia from Johan Gabriel Doppelmayr’s Atlas Coelestis, published in 1742.